Gippsland Power midfielder Alex Carr has tonight won the TAC Cup Morrish Medal. 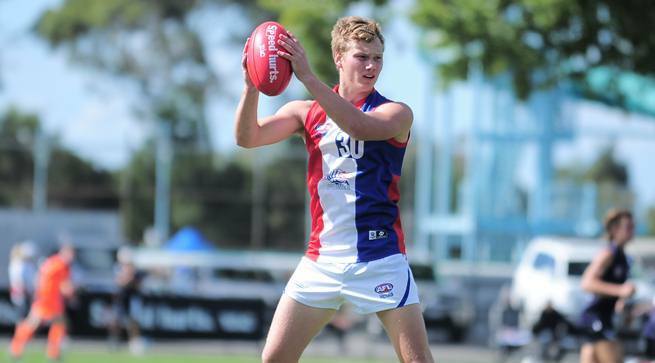 With just seven votes after Round 14, Carr stormed home polling in each of the final four rounds of the season to win the TAC Cup best and fairest on 17 votes, three clear of runner up Oakleigh Charger Toby McLean and four players on 12 votes in Brayden Monk, (Western Jets), Christian Petracca (Eastern Ranges), Touk Miller (Calder Cannons) and Alex Urban (Oakleigh Chargers). In his third year with the Power, the Maffra FC product missed most of his 17th year through injury before playing as a top ager in 2013. This year as a 19 year old Carr played 17 games, polling in eight games with four best on grounds (Round 11, 15, 16, 17), averaging 24 disposals a game. Highlighting his influence in the midfield this year for Gippsland, Carr was ranked first in contested possessions in competition and second for most clearances. Carr completes a three-peat of Gippsland Power Morrish Medal winners in recent years, joining Josh Scott (2013) and Nick Graham (2012) to continue the Power dominance of the award in recent years - the sixth Gippsland Power winner. Carr then hit the lead in Round 16, and entering Round 18 he was left with only one challenger. Carr (16) was two votes ahead of Oakleigh Chargers Toby McLean (14) who had jumped into contention polling in every game from Round 14-17. Carr polled one vote in Round 18 to see him finish on 17 votes, three ahead of McLean, and five ahead of four players on 12 votes including Urban, Monk, Petracca and Miller.